The “versus film” has been with us for decades, even if “vs.” didn’t show up in early movie titles like Frankenstein Meets the Wolf Man. Audiences crave watching cinematic legends smash into each other in duels to the death — or duels to the mutual understanding. Alien vs. Predator, Freddy vs. Jason, Batman v[s]. Superman, King Kong vs. Godzilla (soon ready for a rematch), Jesse James Meets Frankenstein’s Daughter (this really happened), Sherlock Holmes vs. Jack the Ripper (a number of occasions), and Dollman vs. The Demonic Toys. Bring up anything involving the SyFy Channel and sharks and you get hurt. 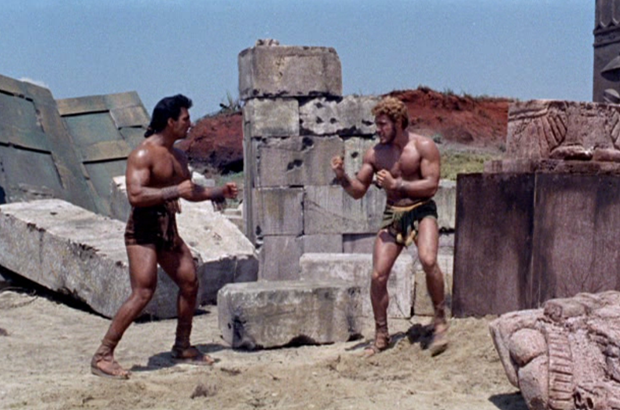 Italian sword-and-sandal (peplum) films couldn’t resist putting titans of the ancient world into the ring together, and there’s no finer example than 1963’s Hercules, Samson & Ulysses. The Italian title translates as “Hercules Challenges Samson,” in case you needed to know who goes up against whom and who is hanging around as the sidekick. When it comes to peplum-as-pulp, Hercules, Samson & Ulysses is the real deal. Appearing at the point in the genre’s evolution when sword-and-sandal films either went stale or went silly, HS&U falls solidly on the positive silly side. It’s an outrageous actioner that knows exactly what its audience wants to see and delivers 100% on the promise of watching two legendary supermen batter each other in muscular absurdity. It may not be the best sword-and-sandal film, but it’s one of the most entertaining. This is the peplum film to watch if most of the genre’s other offerings don’t grab you. It helps that HS&U is one of the rare sword-and-sandal epics available on DVD in anamorphic widescreen and excellent print quality. You can’t stream it, but Warner Archive has a DVD-R for sale, and I think the crazy thing is worth it for the Dumb Fun Night of your week. Hercules was the major presence in sword-and-sandal films, but loose versions of the Biblical Samson from the Book of Judges occasionally popped up in these historical-mythic fantasies. Italian filmmakers weren’t going to pass up another ancient Mediterranean hero with deity-granted super strength. (However, many “Samson” films released in English-speaking countries were retitled from other heroes. Usually the original was Maciste, because Ol’ Cheesesteak couldn’t catch a break keeping his own name in English.) Putting Hercules and Samson together posed no serious challenge considering the Wild West approach these movies take toward history, legend, and continuity. Just wash Herc up on the shores of the Levant and let the muscle fly. The actual premise isn’t much more complicated than that. Hercules (Kirk Morris) and his companions, among them a youthful Ulysses (Enzo Cerusico) who does little to earn the position the English title grants him, shipwreck on the shores of Judea. Not far away, the Tribe of Dan is suffering under the cruelty of the Philistines and their king, Saran of Gaza (Aldo Giuffrè). The Danites have their own protector in the hulky form of the outlaw Samson (Illush Khoshabe). The Philistines mistake Hercules for Samson after they see him kill a lion barehanded, and Samson then mistakes Hercules for a Philistine spy and blames him for the slaughter of a Danite village. With the scheming Delilah (Liana Orfei) goading Hercules along, the two heroes head toward a showdown. After a rumble in the ruins, Hercules and Samson resolve their differences and turn the tables on King Saran. It’s an easy switch for them to make, since most peplum musclemen really want to beat tyrants and help the oppressed. A lot of masonry is hurled, javelins thrown, heads cracked, and our heroes end up happy even though Herc cautions his new bestie Samson to maybe watch out for that Delilah woman in the future. On directing and scripting duties is Pietro Francisci, a sword-and-sandal legend. He directed the films that ignited the craze, Hercules (1958) and Hercules Unchained (1959) starring Steve Reeves. It appears Francisci meant for HS&U to be a direct sequel, since Hercules’s domestic life and supporting cast in Ithaca are identical to what he had in Hercules and Hercules Unchained. Hercules is married to Iole, hangs out with King Laertes’s eager son Ulysses, and Ulysses is still wooing a young Penelope and keeping homing pigeons. King Laertes is even played by the same actor, Andrea Fantasia. In a genre where the idea of “continuity” is almost a myth itself, such consistency is unusual. Francisci tosses in two of the labors from the original Hercules, with the hero killing a bull and a lion, as if to shore up how much viewers are supposed to accept that Kirk Morris’s Hercules just might be the Steve Reeves Hercules. Too bad Morris isn’t up to that challenge. Although Francisci doesn’t have the same budget as for his earlier Hercules movies, he’s a director who knows how to a throw a big action party and keep it focused. Instead of slogging through a lazy finale of two sets of extras swapping blows with stunt swords, we have the team-up of Samson and Hercules taking on all of Saran’s soldiers. Ulysses gives the heroes some advice, which is his only major contribution to the story. The two titans toss stones and then tumble the entire Temple of Dagon onto the hordes of Philistine warriors. The model work as well as the stunts (oh, those poor Italian stuntmen!) are something to behold for such a low budget. The centerpiece, of course, is the hand-to-hand combat between Hercules and Samson among Assyrian-style ruins. A lesser peplum film would stick to having its musclemen grapple and wrestle, maybe throw a punch or two. But when you have two men with heroic strength given by the gods, you want evidence the gods meant it, dammit. That means heroes throwing each other through stone walls, toppling pillars, catching falling capstones, and tossing rock chunks the size of office cubicles. It’s a pure superhero showdown long before the superhero movie existed and exactly what you showed up to see. Even though Herc and Sam patch up their differences fast, the action shifts right away to putting the pain to the Philistines. The Argo even shows up on the shore to clean up the Philistine dregs by launching some Bronze Age superweapons, part of the sword-and-sandal love for ancient gadgetry. Basically, the last half hour is a Saturday matinee blast. But I hear you asking: “Is there a ceremonial dance?” Yes, and it’s a beaut. Delilah cavorts before King Saran while a servant snaps a bullwhip around her. Francisco Lavagnino offers excellent music accompaniment for this. Lavagnino, the Ennio Morricone of the genre, excelled at writing scores with grand liturgical statements and avante-garde effects mixed in as needed. Fun fact: Lavagnino was Sergio Leone’s first choice to score A Fistful of Dollars, but the composer wasn’t available. Kirk Morris (stage name of Adriano Bellini, the rare genuine Italian to play Hercules) appeared in more than a dozen sword-and-sandal films between 1961 and 1965 after leaving his original calling of Venetian gondolier. He played Maciste six times, including in the well-regarded Maciste in Hell/The Witch’s Curse (1962), which I’ll get to in this column eventually. Morris lacks the screen charisma of the two best peplum Hercules actors, Steve Reeves and Reg Park, but he’s serviceable and never irritating. Honestly, after watching Reg Lewis play an insensate beef slab in Colossus of the Stone Age, anybody looks better. Among the rest of the Italian cast, the most familiar face is Aldo Giuffrè as Saran of Gaza. He played the broken Union captain fighting a useless battle over a bridge in The Good, The Bad and the Ugly. Hercules, Samson & Ulysses only embarrasses itself in a single area, which is the sea monster attack on Hercules’s ship that sends him and his crew to Judea. I haven’t mentioned the sea monster before because there’s no reason to get an audience’s hopes up about a monster when it has almost nothing to do with the story and looks so dreadful. The “sea monster” is footage of an elephant seal. That’s it. It occurs early enough that it might trick some viewers into shutting the movie off prematurely. Give it time, this is the only pothole in the road. The rest is grand. The Italian film industry often re-used costumes and props, which is why sword-and-sandal films frequently have a confused time period. HS&U has a troubling version of this: the Philistine soldiers wear re-purposed German World War II helmets. The costuming does make them look more sinister, but I wonder if the filmmakers thought through how this comes across when the Philistines slaughter a Jewish village. Is this an error of frugality? It seems a bit on-the-nose for that, but these films were shot in a hurry. 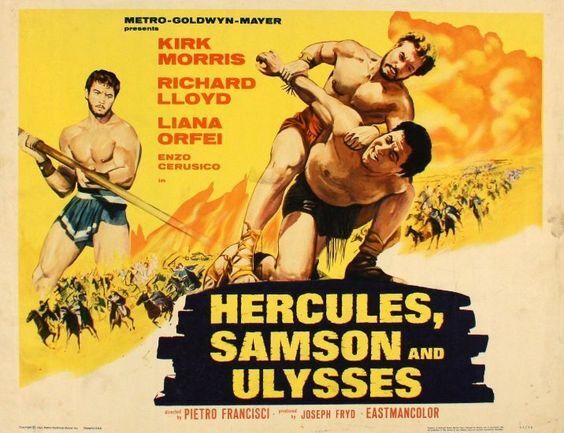 The manufacture-on-demand DVD-R for Hercules, Samson & Ulysses is as high quality as I’ve found for a vintage sword-and-sandal film, but that’s not a surprise since it’s a Warner Archive release instead of a public domain one. According to the major peplum fansite, this is the edited version MGM originally screened in U.S. theaters and is missing the original opening scene. I don’t know what this missing scene is, but the jump from the title sequence into the first sequence is abrupt and lacks the establishing shots or narration common to the genre. Okay, I’ve made the choice: I’ll stick with Kirk Morris the next time and look at Maciste in Hell. Can’t avoid Maciste for long around here. I always liked peplum, and I think it’s a pity the genre was not given the opportunity to evolve. Could have been “the Italian Way to Fantasy”, or something. As for this movie: it is worth mentioning that Liana Orfei, that was often in peplums, Biblical movies and historical fantasies, came from a famous family of circus performers – after her peplum days were over, she went back to the circus (working with trained animals, IIRC), and was often on Italian TV. Anyone remembering her movies could only be surprised (not to say struck speechless) by her older persona.